SQL Server provides a GUI interface to assist you in setting up log shipping between a primary database and one or more secondary databases. However, it is only available in certain editions of SQL Server. In SQL Server 2000, it is available only in the Developer and Enterprise editions. In SQL Server 2005, it is available in all editions except the Express edition. Using the SQL Server log shipping configuration may not always be suitable, for e.g. if the primary and secondary databases are not linked. You can always set up log shipping manually, but you'll need to address the abovementioned issues. While it is possible to ship logs from a SQL Server 2000 database to a SQL Server 2005 instance by setting up log shipping yourself, the database can only be in a recovery state, not in a read-only state. This is because when SQL Server 2005 makes the database read-only, it upgrades the database's internal structures too, making it impossible to apply further non-SQL 2005 transaction logs. 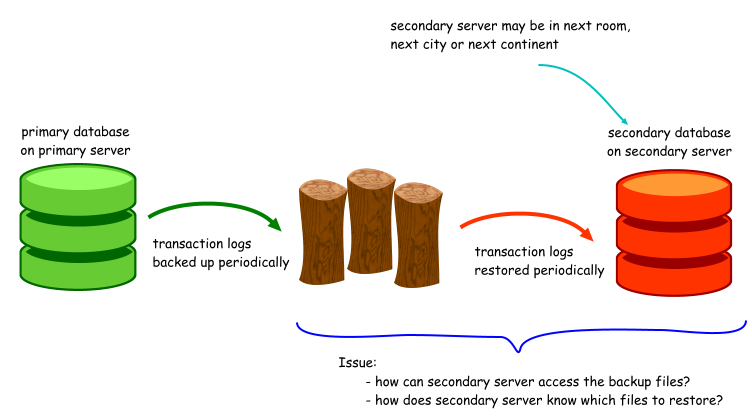 Another consideration when performing log shipping is that the logins on the primary database needs to be synchronised with the secondary database when failover occurs. BOL suggests using the bcp function to periodically export the master..syslogins table (SQL 2000), or sys.syslogins (SQL 2005). During failover, you will need to use the sp_resolve_logins stored procedure to resolve the logins. After that, you may need to relink orphaned users using the sp_change_users_login stored procedure. You can find more details on how to resolve orphaned users in Troubleshooting Orphaned Users [SQL2000, SQL2005].